Of all the winter birds, seeing a snowy owl is the most exciting to me. We don’t see them in Westford; the habitat just isn’t right for them here, they are tundra dwellers. But, I have been lucky enough to see them on Plum Island and at Salisbury Beach most winters. Some years are better for seeing snowy owls than others. This winter is shaping up to be good snowy owl viewing, and I encourage you to make the short trek to the coast to see them. 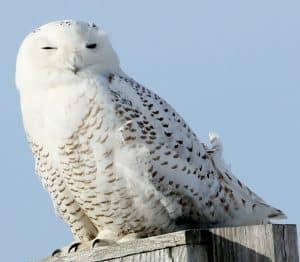 Seven snowy owls have been reported at Plum Island this January and February. Snowy owls are one of our largest owls and are fierce predators with large strong talons. They weigh about 3.5 pounds, and have a wingspan of 4.5-5.5 feet. As in most raptors, females are larger than males. They eat mostly rodents, but have been known to successfully take down prey as large as geese and great blue herons read more….